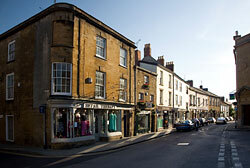 The charming country town of Ilminster is set in the beautiful countryside of South West Somerset. It lies just off the main London to Penzance trunk road and is an attractive, lively place to visit. The town boasts a good selection of cafés, restaurants and shops and there is plenty of tourist accommodation in the area. The town is mentioned in Domesday Book as “Ileminstre”, which means the church on the River Isle, from the Old English words “ysle” and “mynster”, the large church that still towers above the town. 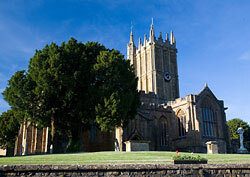 This church of St Mary has a spectacular tower, which is said to have been copied from that of Wells Cathedral. The town also boasts a 16th century former grammar school and the Ilminster Meeting House, which is now the local art gallery and concert hall. The town is very attractive, built mainly from the local ham stone. There are some lovely walks around the area and a great view of the Isle Valley and the town itself can be obtained from nearby Herne Hill. Another local attractions is the Warehouse Theatre. There is a Victorian evening held on the last Friday of November each year, when the town celebrates the switching on of the Christmas lights.